Now you can bring some of the finest museum-quality specimens into your classroom at an economical cost with WARD'S life-like fossil reproductions. Nearly all of the reproductions in this impressive series are cast in durable plastic resin, and are hand-painted in colors designed to capture every detail of the original. Acquiring good natural examples from all orders of the Class Trilobita can be both difficult and expensive. 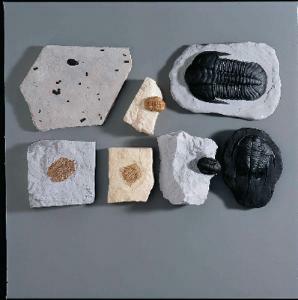 For this reason, we’ve assembled a complete set of trilobite reproductions in resin from originals in the finest private and public collections. Delivery information: The set includes seven orders: Amphilichas halli (Ordovician) Ohio, Basidechenella rowi (Devonian) New York, Olenellus fremonti (Cambrian) California, Reedops deckeri (Devonian) Oklahoma, Leonaspis williamsi (Devonian) Oklahoma, Hemirhodon amplipyge (Cambrian) Utah, Peronopsis interstrictus (Cambrian) Utah.